​​​The Ukrainian opposition is more likely to succeed if its campaign remains primarily non-violent, writes Marianne Dahl, Doctoral Researcher at PRIO. ​This is not the first time that Kiev’s streets have been filled with demonstrators wanting to end Viktor Yanukovych’s days in the presidential palace. In 2004, the Orange Revolution spread across the country and brought Viktor Yushchenko to power. 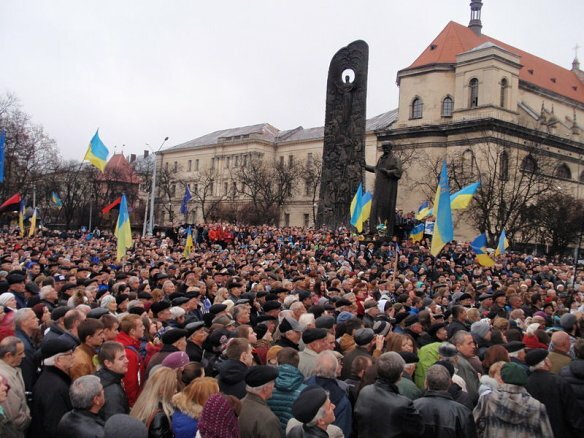 While demonstrations against Yanukovych’s incumbent regime had started as early as 2001, it was first on 22 November 2004, following well-documented vote-rigging, that the protesters’ ranks swelled dramatically with millions of Ukrainians defying the bitter cold to express their discontent. That time the campaign was successful and the costs were low. Only one person died, and the death was due to a heart attack rather than a violent clash between the regime and demonstrators. This is in sharp contrast with the current situation – so far 100 people have lost their lives in clashes between the current Yanukovych regime and demonstrators. Why did the demonstrations in 2004 remain peaceful, while the current protests have resulted in a bloodbath? To understand this, it is necessary to understand the choices made by the military and state security services. In 2004, when Yanukovych and his regime wanted the army and state security services to use violent means to crush the demonstrators, large parts of the military were no longer pro-Yanukovych. Rather than using violence against the demonstrators, the leaders of the state security services stated that they would use violence to protect them. So far, the same security apparatus has aligned itself firmly with the regime. But if a popular movement can succeed in getting all or parts of a state’s security services on its side, its chances of success will improve dramatically. Recent research into non-violent movements whose goal is either to break away from a state or to install a new regime shows that their chances of success are three times greater if there is just such a shift of loyalties within the state security services. For regime leaders, this means at best the end of their time in power, and at worst the end of their time on earth. If the demonstrators in Kiev are to succeed, they will be well advised to appeal to the security services. We know that so far they have not been successful. More than 100 demonstrators have died, and 500 have been wounded. It is unclear why the security services now – in contrast to the situation in 2004 – are willing to use violence to protect the same regime leader. Another question is whether they will be willing to continue to do so in the longer term. Broad-based, non-violent protest movements benefit from their superior ability to mobilise large parts of the population. Although their supporters still risk their lives to some extent, the risk is generally far lower than is the case with violent protests. In addition, the moral and economic costs are generally much lower. While participation in violent protests is seldom compatible with holding down a job, it is easier to combine work with non-violent protests. Previously the predominant view of non-violent campaigns has been that they are the strategy of the weak. According to this view, the only reason to opt for a strategy of non-violence is a lack of the resources required to succeed through violent means. This is not the case. Recent research has shown that non-violent campaigns are almost twice as likely to succeed as violent campaigns. One of the main reasons for this is that non-violent movements are more likely to bring about a shift in loyalties within a state’s security services. An explanation for this is that non-violent movements are generally more broadly based, increasing the likelihood of a network of contacts between the demonstrators and members of the security services. In addition, non-violent movements are better at generating sympathy among members of the security services, just as among the rest of the population. The extent to which the Ukrainian opposition will succeed depends in particular on two factors. Firstly, its chances of success will be greater if its campaign strategy remains primarily non-violent and does not move in the direction of violence. Images of soldiers shooting at unarmed demonstrators have a tendency to generate support within the regime as well as in the international community. US President Barack Obama and German Chancellor Angela Merkel are among those who have contacted Yanukovych to ask for an end to the violence. If the opposition’s campaign becomes one of violence, it is unlikely that this support will continue. A more difficult question is how to ensure that a campaign remains non-violent. While violence may be employed to radicalise a conflict, it is less easy to find non-violent ways of stopping individual groups who want to use violence from doing so. Unfortunately there is much to suggest that the movement in Ukraine is moving in a more violent direction. Last, but not least, there is the question what the security services will do. A continuing non-violent mobilisation will increase the likelihood of the security services severing ties with the regime, but it may be useful for the protesters to adopt more direct strategies. Photographs of demonstrators presenting flowers to soldiers were a common sight during the protests in Egypt in 2011. Similary, during the Iranian Revolution in 1979, demonstrators could be heard shouting “Brother soldier, why do you kill your brothers?” and “The army is part of the nation”. In both cases the demonstrators succeeded in getting the security services on their side. Although it is understandable that the relationship between the demonstrators and the security services is extremely tense, it is worth asking whether it is a good idea to kidnap 27 police officers. The author, Marianne Dahl, is a doctoral researcher at PRIO.